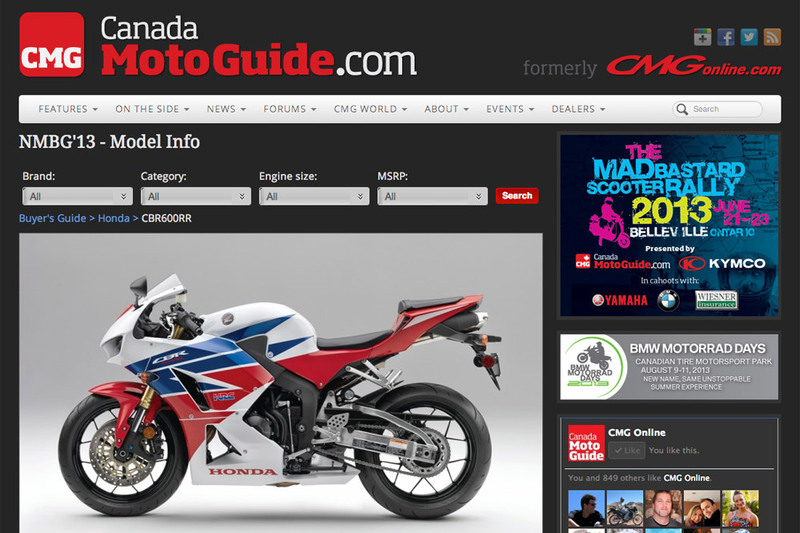 The CMG New Model Buyers’ Guide is a database of all the new models that are available in Canada. 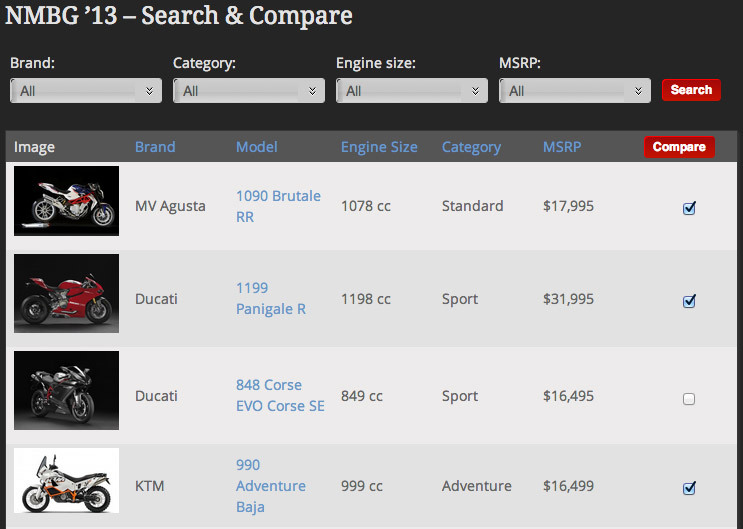 The guide is database driven and so is searchable, with each page offering drop down menus by Brand, Category, Engine Size (by range) and MSRP (also by range). The main homepage offers a complete listing of brands that are included in the Guide along with the number of new models we have inside and a graphical display of the type of new models they offer (cruiser, sport, adventure, etc) and a short blurb about the brand. Clicking on name/logo will take you through to a complete listing of new bikes from that brand, whereas clicking on the category icon will show just that category of bike for that brand. BTW, you can see how we define each category by selecting category info from the NMBG menu or clicking here. Once you’ve made your search selection, you’ll find yourself here. The list of models depends on what you searched by and includes an image and the basic information of each bike (see sample page here). To see more detailed information on a specific model, either click on the image or the model name to open up a new window with pictures, blurbage and a full specification sheet. All you need to know about new models in Canada. Each column header is selectable so that the results can be sorted accordingly to see the most expensive on top or even by high to low cc. You’ll also notice a “compare” button that allows you to select up to four models to compare detailed spec sheets. Simply tick off the models you want, hit the compare button, et voila, everything you ever wanted to compare motorcycles by. This is the detail page for each new model (sample). The image is part of a gallery and by holding your mouse over it, you will be given options to scroll through them all. below that is a summary description of the model followed by a complete specifications sheet. The last spec item is a link to the manufacturer’s webpage on that model to see what they have to say about it. Finally the “Other Related Models” section at the very end shows other motorcycles in the guide that we think may also be of interest to the reader based on their search criteria. Ultimately we’d like to expand this guide to include all available motorcycles (not just the new ones) but sadly an amazing amount of the Canadian importers see this information to be “confidential” in nature and so have (so far) refused to send us it. Building a guide from the ground up by hand would be too labour intensive and likely full of mistakes. However, we’re hoping that by making the NMBG we can convince the powers that be that a complete guide would not only benefit you the potential buyer, but also the dealers and ultimately the importers as more people can see what’s out there and make an informed choice as to which is the best bike for them.